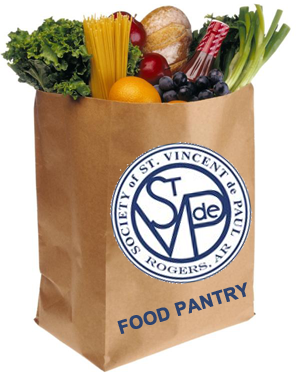 The Society of St. Vincent de Paul Food Pantry opened in December 2004, has grown rapidly, and is now providing food to many hundreds of families per month. The food pantry is our attempt to answer Jesus’ call to feed the hungry. We meet Him in the poor whom we serve. There is a great need in the community and in our own parish for emergency food assistance. Many families have difficulty meeting their basic needs. In the past our parish operated a small pantry by appointment only. Many people would come to the parish office regularly asking for assistance. There was a clear need for a larger food pantry with regular hours of operation. Food, paper goods, and diapers are obtained from monthly Sharing Sunday collections, donations from individuals and vendors, Walmart Neighborhood Market, the Northwest Arkansas Food Bank, the United Way Gift In Kind Warehouse. We have recently begun receiving food from the USDA Commodities Program. Food is provided to families in need in Benton County without regard for race, religion, or national origin. Families are asked to provide identification and proof of residence in Benton County. Basic information including names, addresses, and number of persons in the household is collected. Families may return monthly if needed. For more information on volunteering, please go to Volunteer Needs and for more information of donating food, please go to Current Food Needs. 1413 W Poplar Street. Across from the main entrance of the church. Mondays from 4:30 to 6:30 pm, Tuesdays from 10:00 am to Noon, Thursdays from 9-11 am, and Saturdays from 9-11 am.